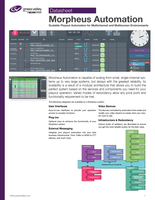 Morpheus Automation is capable of scaling from small, single-channel systems up to very large systems, but always with the greatest reliability. Its scalability is a result of a modular architecture that allows you to build the perfect system based on the services and components you need for your playout operation. Varied modes of redundancy allow any price point and functionality requirement to be met.